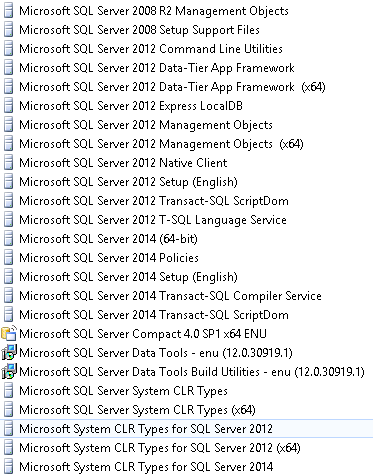 Last week I upgraded our Development box to SQL Server 2014. Since this was a clean Dev box I had the choice of upgrading from SQL Server 2012 or doing a remove-install. I figured that rather than leave all the detritus of the prior installs and versions of Data Tools, I would do a remove-install. Well, uninstalling SQL Server 2012 turned out to be more than just clicking Uninstall in the Control Panel | Programs and Features section. After trying as many Uninstalls as I could, I ended up using CCleaner to uninstall/remove a lot of the remaining bits and pieces. 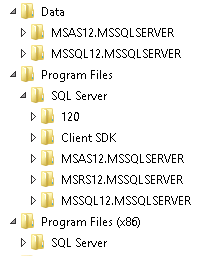 With that done, I manually deleted the SQL Server folders from Program Files and anywhere else I could find them. Then I used CCleaner again to clean the Registry of any SQL Server (now) invalid registrations. I rebooted a few times in there too. Finally, I had scrubbed away as much of SQL Server 8/9/10/11 as I could. So, now I have the SQL Server machine configured, I am waiting for the SharePoint server machine to be delivered. Then we will be off to the races.